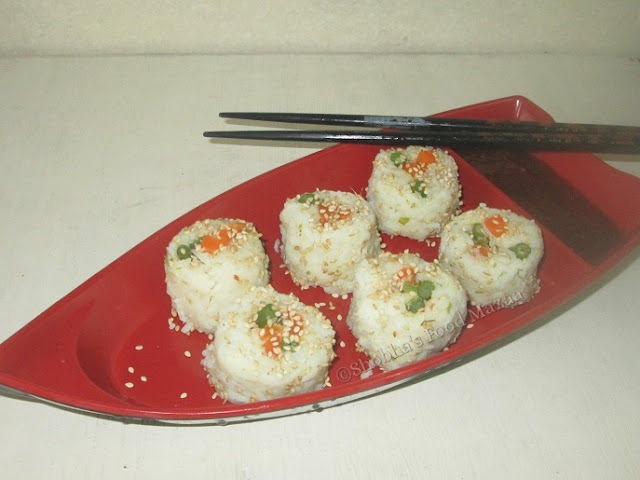 I have tried out Indian version of Sushi with coconut rice and dry avial served with sweet and spicy tamarind, chilli, garlic sauce. 1. Grind the ginger, garlic and green chillies. 2. Heat oil in a pressure cooker and add the ground paste. 3. Saute it and tip in the washed and soaked rice. 4. Add salt, coconut milk and 1 and 1/2 cups water. 5.Close the lid and cook on high for 2 whistles and simmer for half a minute. The texture should be soft like sticky rice. 1. Cut all the vegetables into long and thin strips. 2. Parboil the vegetables with little salt. Keep them crunchy.Drain and set aside. 3. 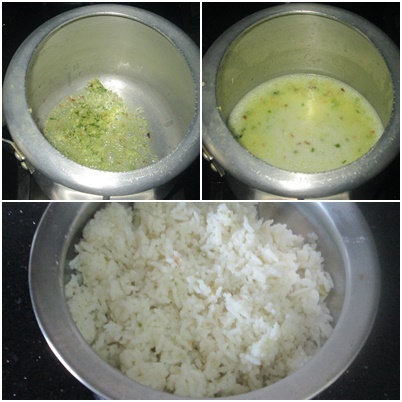 Grind the coconut, ginger, garlic, green chilli with yogurt and salt. 4. Heat oil in a pan and saute the ground paste. 5. 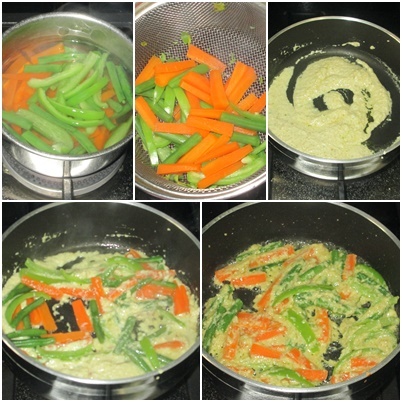 Add the parboiled vegetable strips and saute for a minute. Let it cool. 1. Take the foil paper and grease it with oil. 2. 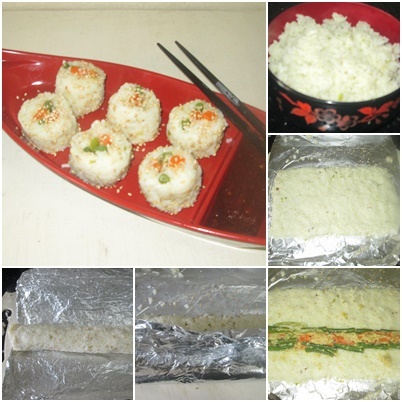 Spread the cooked sticky coconut rice on it patting with your hands so that it sticks well. 3. Arrange the vegetable pieces from the dry avial leaving a little gap from the lower edge. 4. Carefully roll the foil pressing well to make a tight roll. 5. Dip the knife in cold water and slice the roll into equal pieces. I have mixed sweet tamarind sauce and home made chilli garlic sauce in equal proportion. Really innovative and delicious recipe!